By Paul Strauss: Don’t worry, Ricky’s condition was temporary. It was due to a beautifully placed body shot that snuck in under “The Hitman’s” outstretched right arm. There isn’t a more debilitating shot in boxing. It doesn’t matter how many sit-ups you’ve done. If the shot lands on target, forget it. A few years back, Ricky landed a similar shot to the liver of Luis Castillo with the same results. You just don’t recovering quickly from one of those, regardless of whether you have a six- pack, eight-pack or full case of abdominal muscles. 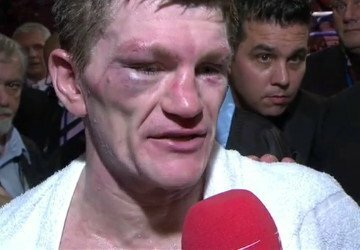 Up until that time, Ricky “The Hitman” Hatton was fighting a good fight at the Manchester Arena, Manchester, Lancashire UK on Showtime Boxing. He was exerting a lot of pressure, and it was obvious he was making Vyachesla Senchenko uncomfortable. Ricky didn’t appear to be a fighter who had been away from the game for three and a half years. He’s never been a technician, so no one was expecting him to be pretty or stylish. Fans wanted to see the old rough house battler they were used to and Ricky was obliging them. Senchenko seemed to be cooperating too. His footwork wasn’t the best. He was walking, rather than shuffling and sliding, and his movement lacked speed. As a result, Ricky was getting to him with short shots. Ricky was controlling the action, but Senchenko wasn’t being dominated. He was getting through with some good straight shots of his own, but they didn’t seem to be bothering Ricky enough to slow him down. As the fight progressed, the Ukrainian seemed to be gaining a little confidence. He started to time his counter shots a bit better. Meanwhile, Ricky was trying too hard to be impressive. He was wild, leaving himself open. Still, there didn’t seem to be any doubt Ricky was winning the fight. Then in the ninth round, Senchenko landed the liver shot. When it’s the real thing, you know, because the recipient’s face seems to drain its color, and a grimace forms. When the referee moves in, the fighter can’t even verbally respond to the question, “Are you alright?”. He can do only one thing, and that is to concentrate on the excruciating pain. That’s what was happening to Ricky. Instead of climbing up from a knee, he went the other direction, into a full- fledged prone position. He was done. It was a devastating result for the 34 year old, who had high hopes of jumping right back into the thick of things and earning a shot at a title with a victory tonight. It looked as though he was doing just that, leading on all three judges’ score cards. Then, the shocking surprise ending occurred. Now, even the probable rematch with Paulie “Magic Man” Malignaggi is likely off. Now move over to HBO and the Citizen Business Bank Arena, Ontario, CA and pick up on the impressive light middleweight Keith Thurman. He had Carlos Quintana on the run from the get-go, but he remained patient and worked for his fourth round stoppage of the veteran Quintana. Carlos was coming off of an upset 6th round KO win over Deadre Latimore, so he was hoping for another one over Thurman, the undefeated knockout artist. It wasn’t to be, and there was never much doubt about it. Quintana didn’t pose a threat to Thurman, who has heavy hands and the good footwork and balance needed to go along with those hands. Quintana relies on movement and getting under shots. He will move in and out, but he doesn’t slip punches. Consequently, Thurman and his corner realized they could fire their shots at Quintana’s chest, and let him duck into them. That’s was a good plan, because Thurman landed a couple of short right hands that seemed to stiffen Quintana’s legs. He became even more of a target, and Thurman bounced several more hard shots off Carlos’ head, and the referee realized he was in bad shape, so he stepped in and stopped the fight. It goes down as a 4th round Kayo. Thurman says he is now ready for anyone in the welterweight or junior middleweight divisions. He did a good job backing up those words tonight. The main event between Andre Berto and Robert “The Ghost” Guerrero started off fast. It seemed like Berto might have been watching Adrien Broner, because he came out with the Mayweather, Jr. like low left and high shoulder. Guerrero wasn’t impressed. For that matter, neither man appeared cautious or interested in going through any kind of feeling out period. It was obvious, both men wanted to lay some hurt on the other guy right away. Guerrero managed to do so first, scoring knockdowns in both the first and second rounds. Hence, Berto quickly found himself in a hole. In addition, swelling was already starting to develop both above and below his right eye. Guerrero was intent on fighting the fight at close range. He wasn’t going to let Berto use his speed to pot shot him from a distance. There wasn’t much jabbing going on. Guerrero was content with working, working and working some more. He wanted to keep Berto busy on defense, and that’s the way the fight was going until Berto gradually regained his senses, and started taking advantage of some of the openings he began seeing. Both fighters engaged in rough house tactics. Leading up to the first knockdown, Guerrero was doing some holding and hitting. On the other hand, through much of the fight, Berto was rabbit punching. Both men employed a little wrestling now and again as well. It was a tough fight. After the Luis Collazo fight, Berto was criticized for not knowing how to fight on the inside. But, it was evident tonight he has learned, because he did a good job landing many right uppercuts and short rights to the chin of Guerrero. In addition, he cracked in some good body shots as well. Shots like those landed tonight to Guerrero’s head were good enough to put down Vicious Victor Ortiz in their fight. But, they weren’t good enough to put Robert down, or even to slow him down much for that matter. The Ghost kept coming right back to resume his attack. In the end, Robert out-worked Berto, landing more punches, and more power shots. In addition to the knockdowns in each of the first two rounds, Robert also finished strong. In fact, he had Berto in trouble again as the final bell sounded in the 12th. Robert deserved and got the win. In the post-fight interview, Guerrero was a gracious winner, complimenting Berto for putting up a great fight. Berto, on the other hand, seemed to want to blame Referee Lou Moret for his loss. All three judges saw the fight the same………UD for Guerrero at identical scores of 116-110. Robert has now demonstrated he is ready for just about anyone in the welterweight division.